A beautiful exploding box which has many element options for you to choose from so you can make the box fairly simple or really fancy! The kit contains 8 fancy elements for both the outer and inner boxes, plus simple square panels for an easier box. 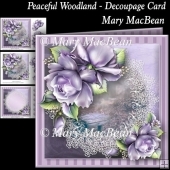 The elements you get are: 4 flap card, easel card, fold out panels, lotus fold, pocket, scalloped pocket, twist and pop and waterfall element. 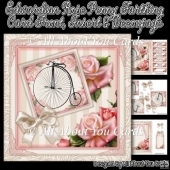 You can choose any combination of these elements for your box and some of elements included have places where you can add messages, greetings or photos. 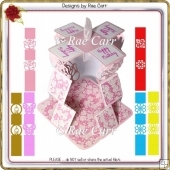 There are also gift box options for the centre of the box as well as a decoupaged stand up picture and 3D baby shoe in choice of pink or blue. 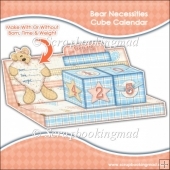 The outer box measures 12cm cubed and the inner box is 10cm cubed. 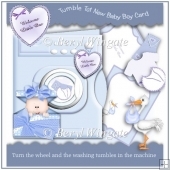 The box is suitable for new baby cards for both boy and girl (or both) as the colours are muted pink and blue. There are no sentiments included so it would be suitable for any other occasion you think it suits. 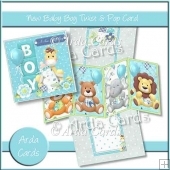 All of the elements for the panels can also be used to create cards by themselves or added to a card front. These kits are huge and have huge creative options for you. 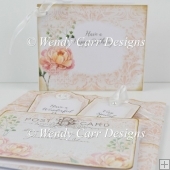 Suitable for new and experienced card makers (some elements require more skill so build up to these if you are new to card making). See the exploding box in action here.